Photography has many uses, but it's most basic one has been of documenting life giving more credibility to an event. It reinforces the acknowledgement of our memories. So, what if we don't have a document to prove it? How can we recall our history, how to witness our pass through life? This project's objective is to create a photograph of a memory you want to have. of a beloved person creates a special emotional dimension, appearing together in the same photograph creates a momentum raising up the emotion. The "client" brings a photo as a base of a memory that wants to be part of. 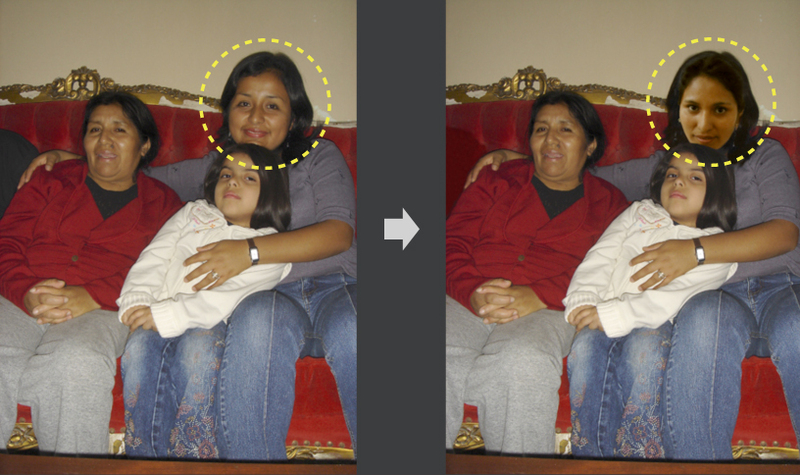 Using digital techniques, a photograph is taken of this person and blended into the base photo to compose the memory that is wanted to be achieved. Ana De Orbegoso, a 2008 fellow in Photography from the New York Foundation for the Arts, created this project originally for their Artist & Audiences Exchange, reaching the community through ABYAYALA Arte y Cultura, a non-profit cultural organization that preserves and promotes Latin American cultural expressions, focusing on the Andean cultures as the backbone of indigenous millenary traditions. A sample of the photo service : Patty lives in New York and cannot travel. She hasn't been able to see her mother for more than 10 years . Patty has a New York born daughter, Andrea, and in order for her to meet her peruvian family, Patty asked the father (a Salvadorian), to take Andrea on a trip to Lima, Peru. 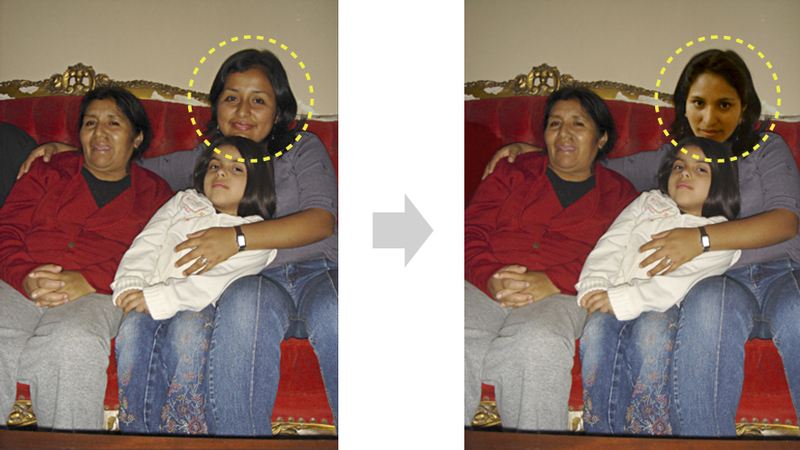 In this photo appear Patty's mother, her sister and her daughter Andrea. The face of the sister was then substituted with that of Patty. "reunited" with her beloved mother. in “his” gathering, finally reuniting him with his old friends. work using Machu Picchu as a backdrop. Regis, peruvian, lives in New York for more than 10 years. and inserted in it, creating their first photo together.